His business lasted all of three days until a law enforcement official was alerted to his business goings-on. However, this would not be Moore’s last venture into entrepreneurship. Steve Moore of Moore and Company, a Commercial Real Estate Group here in Bellingham, has led a memorable life since his days as a horned toad wrangler and he has a story for every part of it. 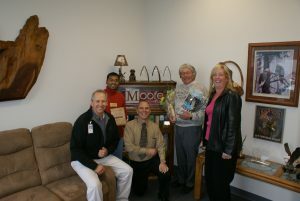 Moore & Company receiving the Member of the Week honor. Included in photo are: Larry Raney, Cale Luna, Scott Hume, Steve Moore and Liz Davis. The wall of his office is hung with a few dozen wooden plaque awards from various times in his life; California Senate, Washington Building Industry Association, Business Person of the Year, Past Chairman of the Chamber, Past Commodore of Bellingham Yacht Club, and several Chamber Most Valuable Player awards. Moore will fix his eyes on one and recall what it was for. He said it’s a problem of his because he remembers everything. Puccini plays in his office; he brings out a stack of CDs to show his favorites, mostly classical and opera. His first 8-track tape was My Fair Lady which his mother gave him to play in his first car which he bought with cash when he was sixteen: a brand new ’64 Comet Station wagon! He was able to purchase it because of an idea he had at age 12. When he was in grammar school in San Diego, his dad had a boat at the waterfront. Steve would help out working on the boat by painting it. He noticed that every weekend, just like his father, people would work on their boats because they worked their job during the week. He realized they hardly had any time to actually take out their boats and enjoy it on the water. Moore’s second business idea was born. He would paint other people’s boats, working in the afternoons after school and on the weekends, so that owners could have time to relax on their boats. “I made up all these little postcards and hand wrote every one; it said ‘Painting by Moore.’ I slipped a card onto every single boat with my price listed at one dollar an hour.” Confident in his idea, he knew he would be receiving hundreds of calls in the next few days and that he was going to be rich. This presented Moore with a huge learning opportunity which would shape a business principle of his which he carries with him today. He didn’t receive a single call from a boat owner for work and struggled to understand why he hadn’t received any calls. His father enlightened him by explaining how his cheap price had conveyed that Steve didn’t trust or value his own work or time very much. He needed to raise the price in order to show to potential clients that he was a skilled and valuable worker. He raised his price to a non-negotiable $2.75 an hour, and advertised to selective boat owners, not just anyone. Moore operated his business all through high school and eventually had to employ people, all older than him, to help with all the business coming his way. He went through the training for the year long program, learning how to live in conditions he wasn’t used to. Moore recalls how many people applied to the VISTA program, but were slowly weeded out through a variety of exercises. Moore was sent to a rather rough town in Arizona for the year, but knew that he would be returning to university once his year with VISTA had concluded. He had applied to a few schools, including one in Washington state where his parents were now living, to resume college once his year with VISTA was up. But 11 days before his year with VISTA had concluded, he was drafted into the Army in 1969 and was sent to Berlin for a while before being sent to Vietnam with the 101st Airborne Division. Growing up he’d seen his father work as a developer, parts of which greatly appealed to Moore. He decided to do something along these lines. He liked that it had to do with land, and he liked the “people” aspect, so he attended California State University Fullerton where he got his Bachelor’s Degree in Real Estate in 1975. All throughout his college career, he worked as a painter, painting apartments this time. He said It was the most boring job and presented no challenge to him at first, so he turned it into a successful business. He began to get creative with his painting and started doing expensive homes and commercial projects, hiring other students and even his younger brother, Michael, to help. 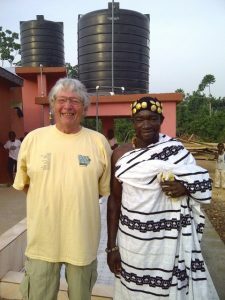 He has created more than one successful commercial realty company, he ran for Mayor of Bellingham, is a Vietnam Veteran, is known as “Funcle” Steve to his nieces and nephews, who have declared him the “Fun Uncle,” and has essentially adopted a village in Ghana, Africa. His passion for serving a small village in Africa began when his younger brother Michael Moore became friends with a priest visiting from a village called Humjibre in Ghana. Michael learned of their need for clean water and donated money for a well to be built. When Michael was invited to the dedication ceremony, he didn’t want to go alone and asked his older brother Steve to join him. Steve returned to help with the inspection of the wells which had been installed. They have since built sanitation facilities for the schools and there are now 13 wells in the village. While in Humjibre, Steve and Mike began helping individuals in the village go into business. Steve used his skills to help the entrepreneurial people of the village develop business plans. Steve and Michael counsel and approve business plans, and then help with funding of the business. The business pays the loan back by putting aside a percentage of their sales each much into an account in Ghana, which will then self-fund future business startups. Moore became a real estate broker right after graduation and soon opened his first commercial real estate company: Pacific Continental Realty, in Orange California. His success continued and his business grew. He joined the Orange Chamber of Commerce on opening his business in 1975 and became their youngest President/Chairman in 1984. He received numerous awards and recognitions from the California Legislature and California Senate. Upon deciding to move to Washington state, Steve, his wife Diane, and daughter Dayna were looking at Bellevue and Bellingham areas and visited both. He knew wherever they moved, that it had to have a university and be near the water. These were his criteria. Considering their options, Bellingham held an atmosphere that they both liked but Moore knew would present more of a challenge in getting his business off the ground, so they chose Bellingham for its personality and opportunity. 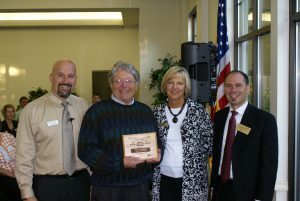 Steve Moore receiving the chamber of commerce MVP award. Pictured in photo: Drew Graham, Steve Moore, Kathy Cross and Scott Hume. Upon opening Pacific Continental Realty in Bellingham in 1990, Moore began gathering clients and momentum, so much so that he had to hire agents. He joined what was then the Whatcom Chamber of Commerce and Industry in 1990 and offered improvements and ideas for board members. Moore created the ongoing Business After Business event in 1992 which chamber members look forward to each month as a social event for networking and getting to know one another. As his company grew in Bellingham, Moore decided that he would like to work on his own, so he sold Pacific Continental Realty and opened Moore and Company 2002. 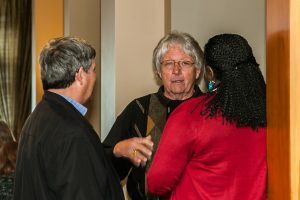 A candid shot of Steve Moore networking during a Business After Business. Moore has always been a huge proponent of Chambers of Commerce, having served as the Chairman of the Board of the Chamber in 2008, and believes in businesses helping one another. Moore still has a huge desire to help people as much as he can and he has carried this out in the last decade on an elaborate scale.